The foundation of the personality is laid during the school period. The environment during these most impressionable period must be provided for physical, intellectual, nutritional, aesthetic, emotional and social development of the child. The school provides education that nurtures the traditions of our culture and also absorbs the finer influences of the west. It focuses on all round development of personality and thorough education in order to make them conscientious and responsible citizens. To provide outstanding teaching resources so that students intellect, social, cultural, physical, emotional and spiritual development takes place. To encourage students to develop a sense of responsibility towards community, country and world as a whole. Knowledge gained will be used for developing skills that will enhance student's vocational learning. Learning is practical and teachers are facilitators. To provide a caring environment in which individual attention is given to the general well being of each student. To love and respect traditional and moral values. Respect for Nation, environment, resources and elders are taught to the children for better society in the future. By 2020, The school will ensure the selection of their students in various competitive exams like IIT-JEE, NEET, AIIMS, KVPY etc which will help the student to make their career in various field after 12th exams. To achieve this mission the school will develop separate department "Department of Competitive Exam Preparation" the school will appoint "Competitive Subject Expert" for each & every subject like physics, chemistry, biology, mathematics for preparation of competitive exams. School will appoint permanent "Student Career Councillor" who will give guidance the students to choose subject after X class using different psychometric. 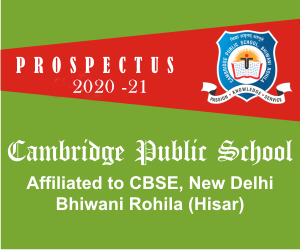 The school will provide "Printed Notes" to each and every student for preparation of competitive exam. By 2020 the school also provide different science models like Set of Atomic Models, Periodic Table & Own Recorded Video Lecture of each and every topic. So that students can revise every chapter at their home after school and can revise every topic whenever they required. To achieve this mission the school will record "Audio Visual Lecture of Teachers and Subject Expert of our school". These video lecture will be also uploaded on the website of our school. By 2020 we will also Develop moral ethics & value based education system in our school. To achieve this mission we will emphasize on moral ethic and value based education. We will develop 5"C" in our students. Because if any person have these 5"C" definitely he will success in his life as well as he will prove asset for our society which is today's real need of life.